The concept of putting suspension inside a wheel can be traced back to the early 1800's. 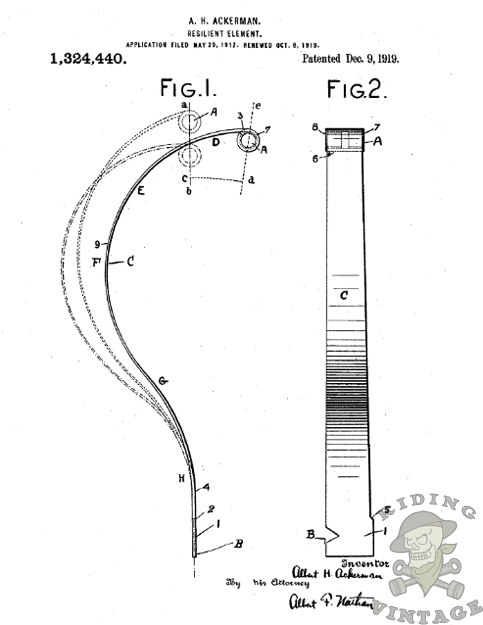 Over the next 100 years, you can find multiple patents which detail different designs for in-wheel suspension. For those interested, Hemmings has a very thorough article on the history of spring wheels on their blog. 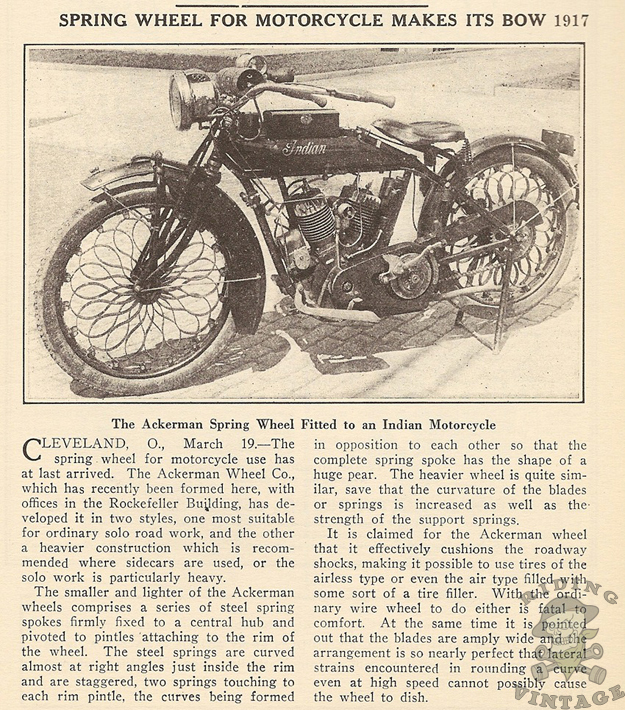 For me, it doesn't get interesting until 1917, when the Ackerman Wheel Company., developed a spring wheel for motorcycles. The Ackerman Wheel Company's design used strips of spring steel, about half the width of the rim, to replace the spokes on a traditional motorcycle wheel. The strips were fixed to the center hub and then attached to the rim via pintles (a pin or bolt which is part of a hinge). The length of the strips was longer than the distance between the hub and rim, which caused them to bow out, creating a spring. By attaching the strips to the rim via pintles, a pivot point was created which increased the range of motion for the springs. Two styles were produced, a light model for solo bikes and a heavy model for sidecar use. Just from looking at the pictures, you can see that this design would not have provided a great deal of suspension travel. Since the distance between the hub and rim would change when the suspension was depressed, the springs had to be fairly rigid to keep the wheels from rubbing the inside of the fenders every time the motorcycle hit a bump. But that actually was not as big a problem as one would suspect. Keep in mind, that in 1917, the standard motorcycle suspension consisted of a set of pneumatic tires. The roads of that era were not maintained to a level approaching anything we would expect to ride on today, especially if you did not live in a city. Dirt roads were still very common and because of this motorcycle riders often had to deal with flat tires. The appeal of the Ackerman spring wheel was that the small amount of suspension travel that it added was similar to that of a set of pneumatic tires. This made the Ackerman spring wheel a reasonable replacement for pneumatic tires. With the spring wheels installed, the rider could mount solid rubber tires and eliminate the possibility of ever getting a flat tire again.